Hello my dears! I have a super easy project to share with you today! 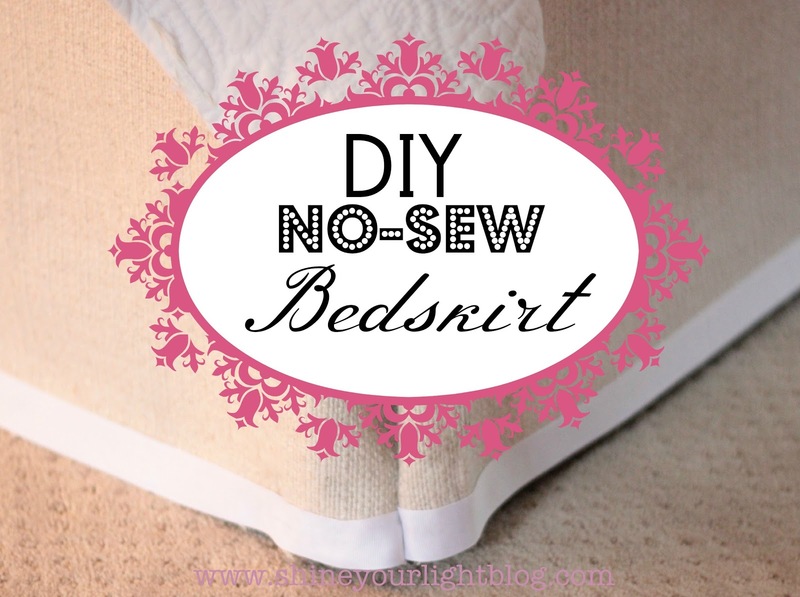 DIYing your own bedskirt opens a world of possibilities for the fabric you could use, gives you the ability to customize the length of the skirt, and can be economical depending on fabric choice. 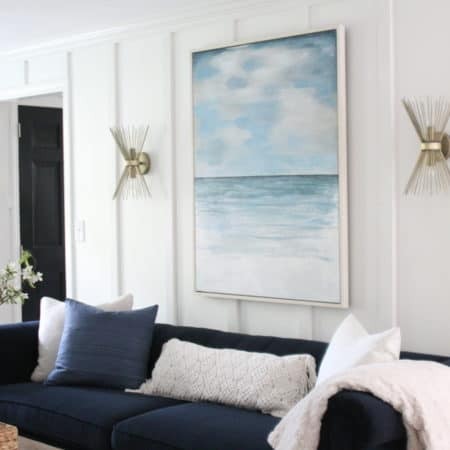 2.5 yards of fabric divided into 3 panels was perfect for me, but you could also use a divided flat sheet for this project. 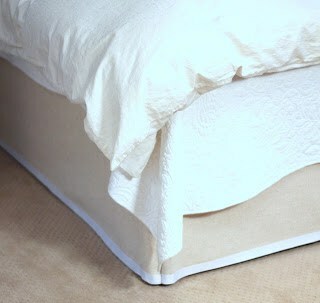 I never loved our old bedskirt – it always looked disheveled. Remember when I mused about taking care of this last year? 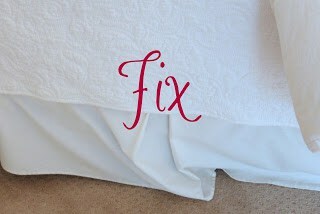 After recently putting our bed on risers so that I could store out-of-season clothes underneath, the old messy bedskirt was too short. I finally got my act together and made a new one, inspired by this tutorial at A Walk Through. Since I had fabric leftover from my headboard, I opted for a straight skirt instead of gathered. First I measured the drop from the top of the boxspring to the floor – 16″ in my case. A standard width of fabric is 54″ so I was able to get three even pieces of 18″ out of my fabric (2 sides and front). 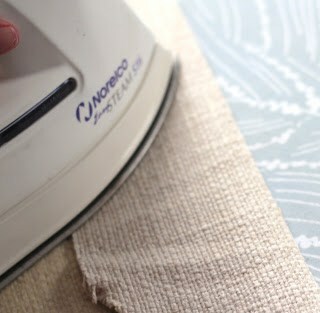 If your drop is longer you will need more yardage of fabric so make sure to measure. 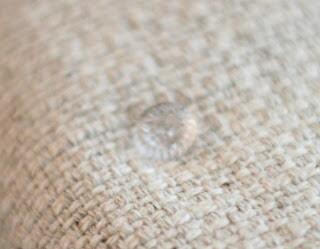 Make sure to add 2″ onto the drop width you need so you will be able to attach the bedskirt to the boxspring. Also, if you are making a gathered skirt, you will need to double the length of your fabric. 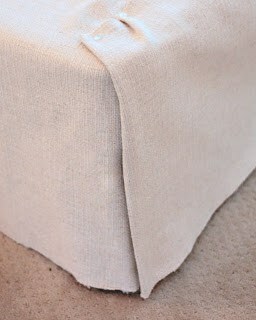 After dividing my fabric into three panels, I finished off the raw edge that would touch the floor with grosgrain ribbon. FabricTac glue works well to attach the ribbon (I used a paint brush to make sure that it was spread evenly), or iron-on hem tape would be great here too. 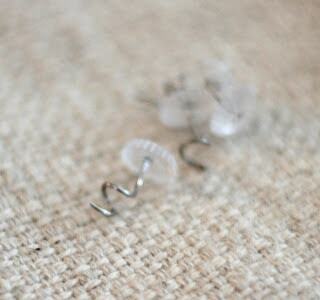 I used these spiral bedskirt pins to attach the fabric to the top of the boxspring. 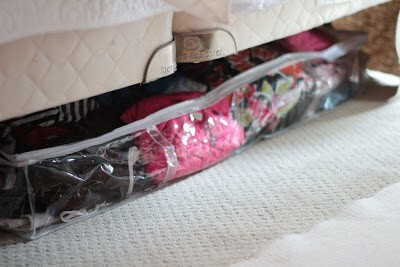 You just twist them into the fabric of the boxspring and they hold the skirt on nice and secure. I used one every 10″ or so to attach the side pieces of fabric. 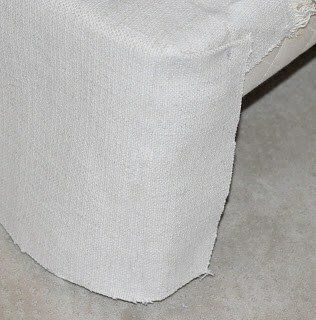 By the headboard, I folded the end of the fabric before pinning so that the raw edge is hidden. At the front corners, I wrapped the fabric around and pinned. I fussed with the corners forever, only to discover that the bedding obscured them almost entirely! That’s it – a simple customizable bedskirt. Can you believe how easy that is?? PS When I’m doing these kinds of things, I like to get really dressed up in my fancy clothes. These are my favorite jeans ever and I will never ever throw them out. We are committed to each other for life. 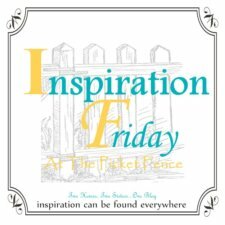 I’m linking to some of my favorite blogs this week and hope you’ll join me for tons of inspiration! Such a perfect idea! I love the texture and the addition of the ribbon! It looks like a million bucks!! Great work! You had me at no-sew! 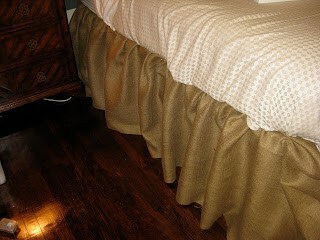 Seriously, the bedskirt looks professionally done! And I have 2 pairs of ripped comfy jeans I refuse to part with. Mine are paint spattered too and sometimes I even wear them to the grocery store! I love it….and the jeans. Great tutorial. It looks so professional! 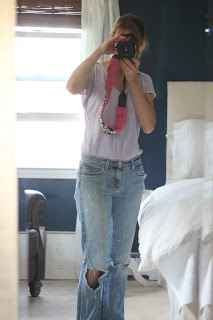 I have a pair of jeans just like those…love 'em. Such a smart, simple idea! 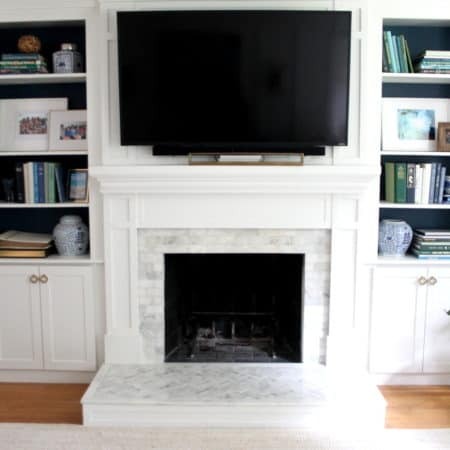 I need to do this in my guest room SO BAD. Wow, who knew that it could be that simple. Love the look too. You look fabulous. I can see why you're committed to those jeans! this looks wonderful! I need to do it to mine. Great easy no fuss..thanks for sharing! Great tutorial. I will be featuring this tonight at my Swing into Spring party that opens at 8pm EST. Please stop by and pick up an I've Been Featured button. Thanks. I love your bedskirt tutorial. Those special pins are the greatest aren't they. 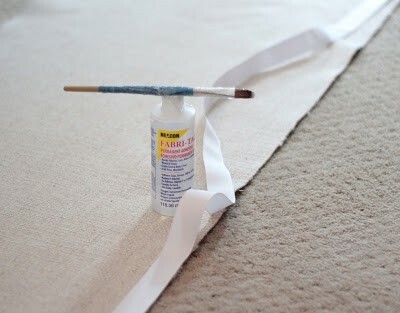 I use them on my sofa's slipcover. They hold everything just where you want. I'm hoping over from DIY by Design. It's my first time here and I'm really likin' it (including your "fancy" jeans)! Should you feel free to grab my button, please do! I love this so much that I'm going to try this at home. LOVE the no sew!